Perceptions of the conflict between Israel and the Palestinians differ considerably across regions. As in the past, Americans’ strong pro-Israel stance sets them apart from other publics. By more than four-to-one (49%-11%), Americans say they sympathize with Israel rather than Palestinians, a balance that is largely unchanged from past years. In many countries in Western Europe and elsewhere, large percentages say they do not sympathize with either side in the Israeli-Palestinian conflict, or decline to offer an opinion. Among those who choose a side, greater numbers in France, Great Britain, Sweden and Spain say they sympathize more with the Palestinians than with Israel; the Germans, Czechs, and Slovaks tend to sympathize with Israel. Fully half of Italians volunteer that they sympathize with neither side in the Israeli-Palestinian conflict, the largest percentage in any country surveyed. The survey finds a little less support for Israel in Great Britain, France and Germany than in 2006 surveys conducted before Israel’s war with Hezbollah in southern Lebanon. The current survey was conducted in April and May (April 6-May 29), before Hamas took over the Gaza Strip following a violent struggle with Fatah. In the Middle East, as well as in Asian nations that are largely Muslim, sympathies overwhelmingly lie with the Palestinians. Opinions are the most one-sided in Egypt, which borders the Gaza Strip; 93% of Egyptians sympathize with the Palestinians. In Lebanon, Christians are somewhat less likely to side with the Palestinians (50% do so) than are Shia (85%) or Sunnis (75%); still, only 8% of Christians say they sympathize with Israel. In Africa, Israel enjoys substantial support in Ivory Coast, Kenya, Uganda, Ethiopia, and Ghana. Public sympathies tilt towards the Palestinians in the predominantly Muslim countries of Senegal and Mali. In countries with large numbers of both Christians and Muslims, there are differences between the two faiths – in Ethiopia, Tanzania, and Nigeria, Christians tend to side with Israel, while Muslims feel more sympathy for the Palestinians. Western publics generally believe that a way can be found for Israel to exist so that the rights and needs of the Palestinians are addressed. The picture is quite different, however, among Muslim publics in the Middle East. More than seven-in-ten Egyptians, Jordanians, Palestinians, and Kuwaitis believe “the rights and needs of the Palestinian people cannot be taken care of as long as the state of Israel exists.” Lebanese opinion is divided on this issue: Christians tend to believe strongly that coexistence can work, while the Shia community overwhelmingly disagrees. Among Lebanese Sunnis, 57% believe a way can be found for Israel to exist and Palestinian rights be addressed – a far greater percentage than among Sunnis in other countries. Majorities or pluralities in Western Europe and North America – as well as 61% of Israelis – say a way can be found for Israel to exist so that the rights and needs of the Palestinians are addressed. But this belief has declined since 2003 in Britain (71% in 2003, 60% now), Italy (65% in 2003, 48% now), and Spain (53% in 2003, 45% now). There is no global consensus regarding whether Israelis or the Palestinians themselves deserve more of the blame for the lack of a Palestinian state. Moroccans, Turks, and Palestinians are among those most likely to blame Israelis, while Israelis, Americans, and Czechs are the most likely to blame Palestinians. While in many countries respondents volunteer that they hold both sides accountable or large minorities decline to give an opinion, the French are especially likely to assign responsibility to one side or the other. 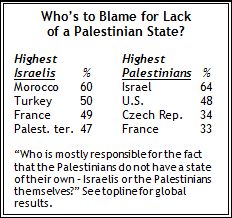 As a result, relatively large numbers of the French blame either the Israelis (49%) or the Palestinians (33%). In several countries many people volunteer that they blame other countries – rather than the Israelis or the Palestinians – for the lack of a Palestinian state. Sizable minorities in several Muslim countries blame the U.S.; in Egypt, for instance, 31% say the U.S. is mostly responsible for the fact that Palestinians do not have a state, while 43% blame the Israelis (43%). In addition, Arab nations also receive a modest share of the blame for the lack of a Palestinian state. In this regard, the views of the Palestinians are revealing: 47% say Israel is mostly responsible for the lack of a Palestinian state, while 14% largely blame both sides, and 10% mostly blame the Palestinians. And while 10% of Palestinians see the U.S. as mostly responsible for their situation, about as many blame Arab countries (13%). Embattled Palestinian Authority President Mahmoud Abbas draws mixed reactions throughout the Middle East, as well as in other countries with large Muslim populations.1 Solid majorities in three Middle Eastern publics – Egypt, the Palestinian territories and Jordan – say they have a lot of confidence or some confidence in Abbas to do the right thing regarding world affairs. Notably, two-thirds of Egyptians express at least some confidence in Abbas – the highest level of confidence recorded in any of the 18 countries in which this question was asked. Attitudes toward Abbas are equally mixed outside the Middle East, though large minorities in most countries in which the question was asked do not know enough about him to have an opinion. In Indonesia, a slight majority (53%) has confidence in him, while favorable views outnumber negative judgments by two-to-one in Pakistan. Opinions are mixed in Malaysia and Bangladesh. Views of the militant group Hamas also vary throughout the Middle East. About six-in-ten Palestinians (62%) have a favorable opinion of the organization, as do majorities or pluralities in Jordan and Morocco. Opinions of Hamas are divided in Egypt and Kuwait, and Hamas is viewed negatively in Turkey. The balance of public opinion in Lebanon is against Hamas (67% unfavorable), although the organization is rated favorably by half of the country’s Shia community. Hamas – a Sunni organization – is overwhelmingly unpopular among Lebanese Sunnis. In largely Muslim countries in Asia, Hamas tends to be popular among those who are able to offer an opinion, while in Africa the opposite is true – most who have an opinion do not like the organization. In the Palestinian territories, most of those who express a favorable opinion of Hamas also tend to have a positive view of Abbas, who is affiliated with Fatah, a rival Palestinian organization; 52% of Palestinians with a favorable opinion of the militant Islamist organization also express confidence in Abbas to do the right thing in world affairs. Among those with an unfavorable view of Hamas, the president is slightly more popular – 65% express confidence in him. Throughout the Muslim countries of the Middle East, overwhelming majorities believe U.S. policy in the region favors Israel too much, including more than eight-in-ten respondents in Jordan (91%), the Palestinian territories (90%), Lebanon (89%), Kuwait (86%), Egypt (86%), and Morocco (81%). This belief is widespread in other largely Muslim countries as well, such as Indonesia (69%), Bangladesh (55%), and Malaysia (55%). In addition, solid majorities in France (62%) and Germany (57%) who say U.S. policies favor Israel too much. Even in Israel, a slim 42% plurality says America is too supportive of their country, while 13% say the U.S. favors the Palestinians too much and 37% say U.S. policies are fair. About a third of Americans (34%) see U.S. policy in the region as fair, 27% see it biased toward Israel, and 8% biased toward the Palestinians. With few exceptions, only small minorities of respondents in the 37 countries where this question was asked see American policy as overly supportive of the Palestinians (it was not asked in sub-Saharan Africa).